Quinns: Paul, I need an ambulance! Quinns: Even better! Remember my positive review of Quadropolis (pictured above)? Days of Wonder has just announced the first expansion for it. Quadropolis: Public Services will see a selection of buildings laid out between rounds like a concrete chocolate box, and whether you select a fire station or get stuck with a convention centre, it’ll change how you score. Paul: Quinns, I’m just going to stop you there. We’re going to go LIVE to this site’s resident Quadropolis expert for some analysis. Yes, the satellite has just linked up and we’re joined by Quintin Smith, here on location! Paul: Quintin, level with us, is this expansion a good thing? Quinns: I think it’s a great thing, Paul. 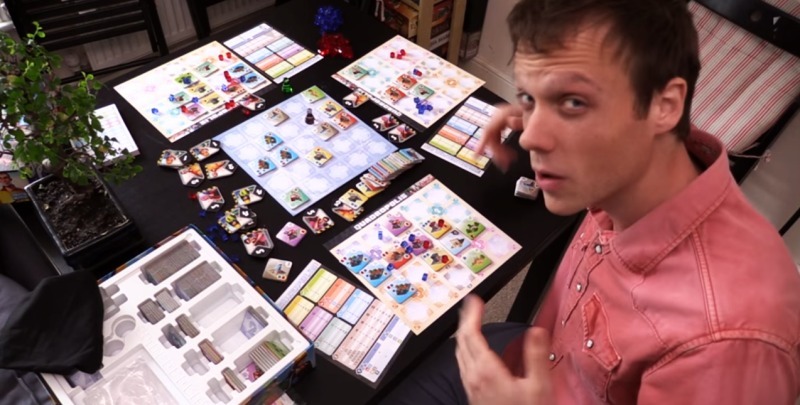 Quadropolis is a crowd-pleaser, no-one’s arguing with that, but it would be even better if the cities you’re building ended up looking a little more cramped, complete, personal and error-ridden by the end of the game, and having to place more buildings in a game would do just that. I think this expansion could be very good for Quadropolis. Very good indeed. Paul: You’re saying MORE CITY is BETTER CITY? Yes, I can agree with that. A lot of cities get thick and heavy and dense and weirdly unusual. I’m totally okay with Quadropolis reflecting a little bit of that. Quinns: Yes! 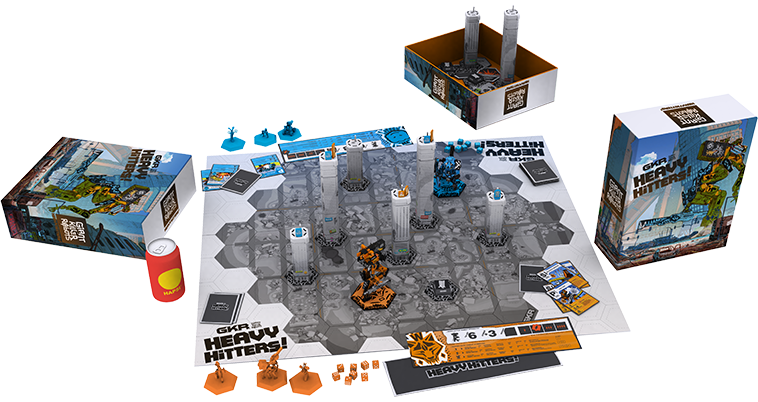 I’d seen some promotional pictures of Giant Killer Robots: Heavy Hitters stomping around the internet before this week, so I already knew it was a hex-based miniatures game, and I knew it had a Kickstarter coming this month. It was only this week that I started reading about it, though, and discovered what a potentially awesome proposition it is. It turns out all the miniatures design and world-building is being done by Weta Workshop, the New Zealand based prop superstars responsible for The Lord of the Rings trilogy! At first glance I hadn’t paid much attention to GKR, but looking more closely at the site I found that I loved everything I was seeing, from the cheery, overly-commercial tone of the game to the teetering manga aesthetics. Paul: This is a team of people who are extremely, extremely good at making things. Making interesting things. And not just for hobbits. 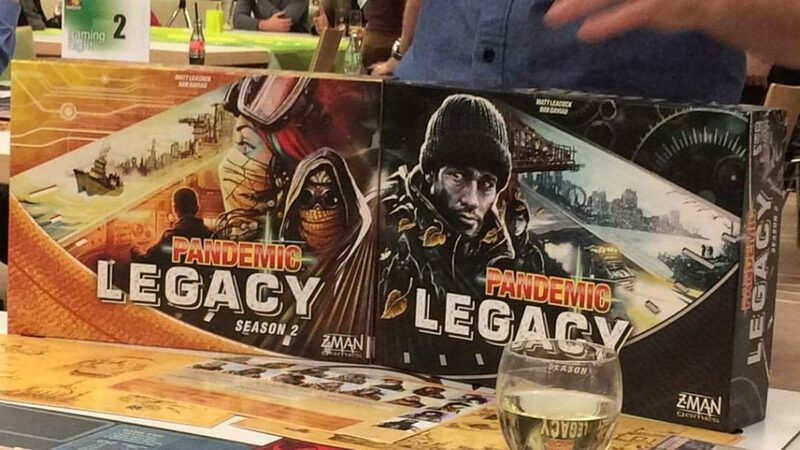 I would be very curious to see not just how this turns out, but also if they plan to make more board games, miniatures games or anything else that we can play on our tables. Quinns: This isn’t all their own project. 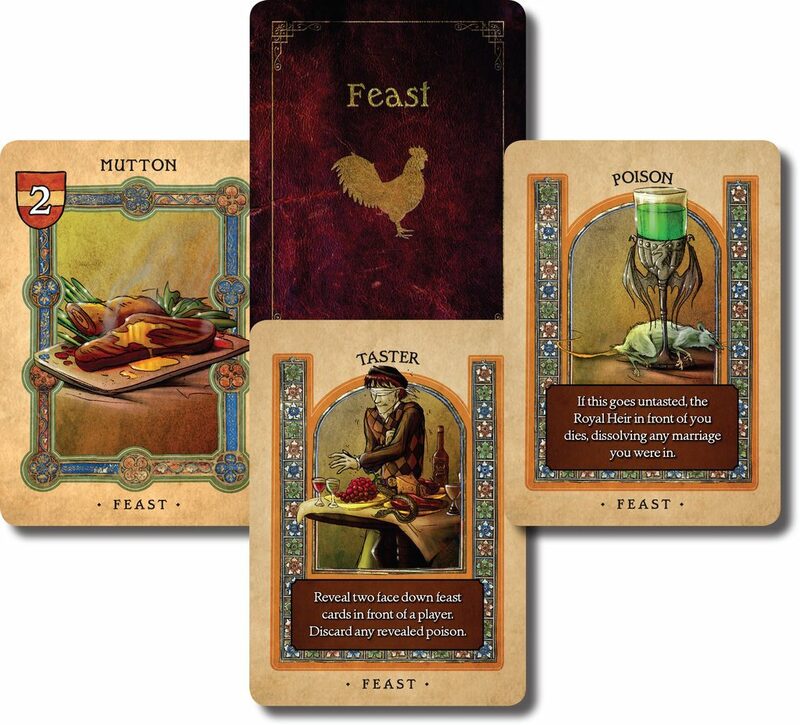 Weta Workshop is working with a board game design studio to bring this vision to life. The only problem is that the studio in question… is Cryptozoic. A company that’s yet to design anything in-house that this site has been able to recommend or be really excited about. But hey, there’s a first time for everything I think Weta being involved in board games is just awesome. If nothing else, it shows just how much attention all those supremely successful miniatures Kickstarters have gained. Paul: Well thank you, Quintin. Now back to the studio for some… oh my, some hot news just coming in. 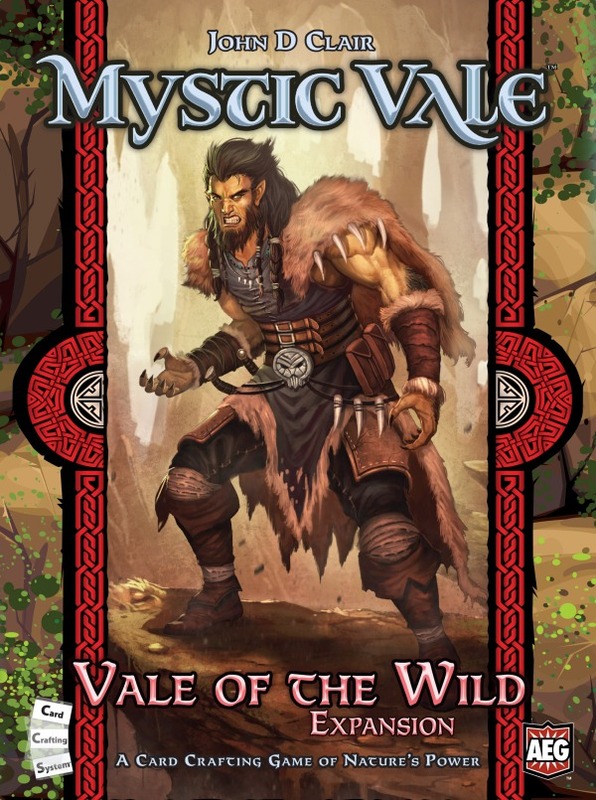 It turns out that transparent magical card malarky Mystic Vale has its next expansion incoming, just two months away, as part of a busy AEG schedule, and this is a game we very much wanted to watch grow and develop. The “card crafting”, as they like to call all that card modification, is an interesting and clever system that we didn’t quite feel reached its full potential in the base game. Here with me in the studio I have expert card player Quintin Smith. Quintin, what are you most hoping to see from this “Vale of the Wild” expansion? Paul: I’m sorry, I’m going to have to stop you there and cut to our reporter at AEG who is examining some of those other releases in more depth! Quintin Smith, this is a roster that really has you rustling with relish, is that right? Quinns: It sure does, Paul. I’m very interested in both The Captain is Dead and Cutthroat Kingdoms. We’ve got chaotic co-operative play in the former, which is a reprint of a popular Kickstarter from 2014 and which puts players on an imperiled space ship, in roles like the Chief Engineer, Medical Officer and Tactical Officer. They have to work together and combine their various different skills, fighting off alien boarders and generally keeping things from falling to pieces. Quinns: Yes Paul, I do. The atmosphere here is absolutely electric as games journalists are on the edge of their seats waiting for more and more information about GMT’s Apocalypse Road. 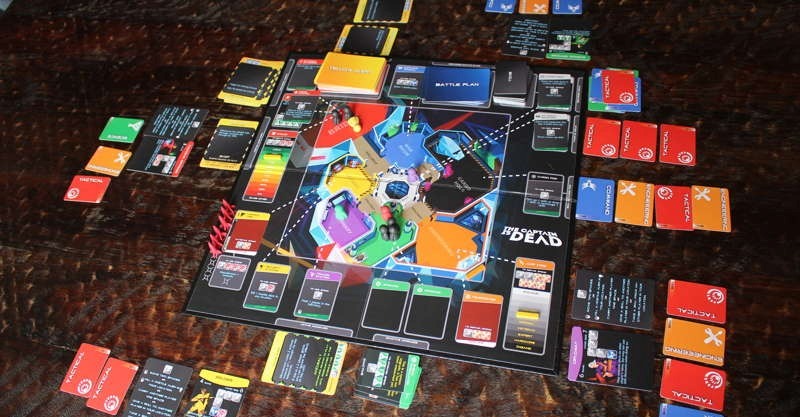 Thanks to another tip-off from the good people at Dice Tower News, we’re all here excited to find out everything we can about this forthcoming game of violent far-future racing. It’s Formula D if the D was for Death, or Mad Max if Max vaguely cared about finishing first and, let me tell you, I really want this. Apocalypse Road will come with four tracks around which you can race and jump and ram cars armed with all sorts of demented weapons, but it can also be played using tracks from GMT’s Thunder Alley or Grand Prix. It’s being funded by their P500 program, which is a discount pre-order system a little like Kickstarter. If five hundred people place orders, they’ll print this. Paul: Hah, I am very, very certain they’ll get more than enough orders to go ahead and print that beast. It reminds me a little of Games Workshop’s old Dark Future, except much more developed and interesting. Now, Quintin, I want to keep you on the line there, but first we have to cut back to Kickstarter because we have an exciting new expansion for SU&SD favourite Two Rooms and a Boom and… yes… yes. Predictably, I’m hearing that it’s already shot way, way past its terribly modest funding goal. 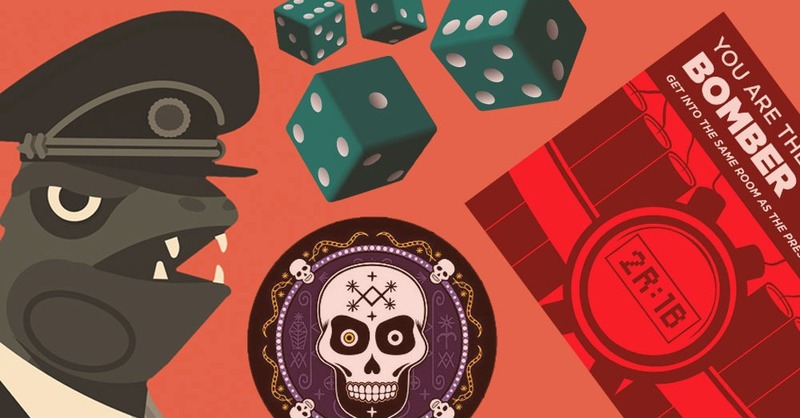 Necroboomicon is a tiny, tiny five dollar expansion that adds “over eight” new cards to a game that already has so many interesting roles and, I reckon, is going to make players even more paranoid. There’s the Seeker, nosing into everyone’s business, the Illuminati, who can convince people they’re on both teams with a little sleight-of-hand, or the Paranormalist, who can steal other people’s cards. There’s also some sort of secret mystery bonus going on that the creators are remaining tight-lipped about. This may well be the most exciting five dollars you spend all year and it just makes me want to have /more/ friends around for gaming all the time, so that we can enjoy party games more often, though this expansion tries to fix that herding issue by skewering things toward smaller player counts. It also makes me want to invent even more Two Rooms roles. Is this perhaps a very, very expandable game that will continue to grow? What’s the forecast? Quinns: Good question, Paul! Hi, I’m Quintin Smith and I’m here today with a special look ahead to some of the week’s most tangible considerations. Take, for example, David Sax’s book Revenge of the Analog, discussed here in the New York Review of Books. This looks at a the growing popularity of physical things we were starting to consider obsolete. Vinyl records, pocket notebooks and, of course, board games. Paul, I believe you were interviewed for this book? Paul: Does that also mean I was obsolete but now I’ve come back into fashion? It really does feel that way, sometimes. I’ve always said that the return of local co-op video games came from us forgetting how much we enjoyed playing games in the same space together and I feel that some of what author David Sax is saying here is the same: not everything we do is easily replaced by new technology, or perhaps even needs to be. I like my notebooks because they just work in a way that nothing else does. My iPad is really useful for some things. It’s bloody useless for actually writing anything down. Quinns: This also ties in with a feature Leigh wrote last month about pulling away from social media and enjoying more tactile things, completely offline, which itself is a really interesting thing to consider at a point in history where some people have simply grown up with it, have always had it. Is there a little too much of it? Do we need to dial back on our use of it, or how we use it? Paul: Don’t ask me. You’re looking at a guy who got Facebook late, got Twitter way later than most of his friends and only got an already outdated smartphone in 2014. And I still have that same smartphone. And one of my favourite things to do is just turn it off for a day. I really like social media and find it very useful, but while it can make me look like an open and accessible person sharing all sorts of things… I put up my fences years ago. And behind those fences I dug a ditch. A ditch filled with spikes. Which I couldn’t even clear if I wanted to! Because of all the land mines. Quinns: PAUL CALL AN AMBULANCE FOR GOD’S SAKE. Paul: Oh, I completely forgot! What happened? Quinns: I tried to clone myself to make reporting the Games News easier but… something’s gone wrong and I now feel very ill. And there’s lots of me everywhere. Paul: Okay! I’ll get right on it. Sorry, I got distracted by Duolingo. 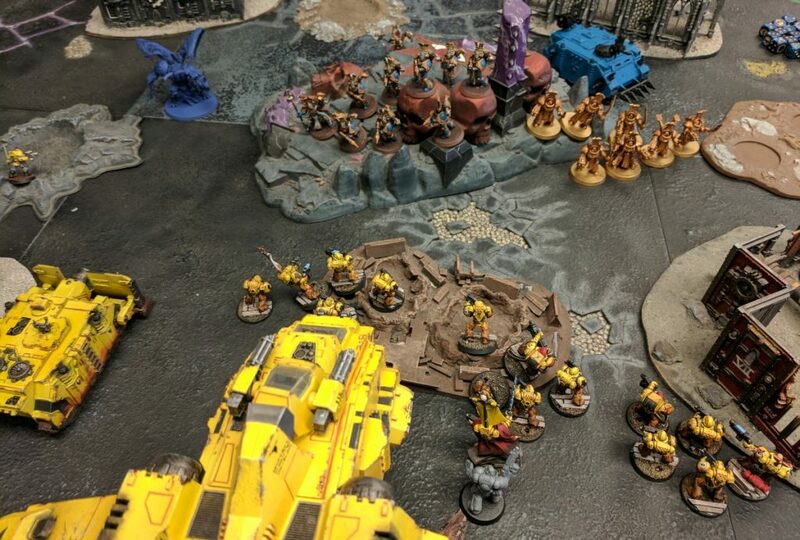 There seem to be 40k miniatures in a French person’s fridge. Do you know how that happened? Quinns? Quinns?